OTTAWA — Matt Duchene had two goals and an assist for the Ottawa Senators in a 6-4 win against the Pittsburgh Penguins at Canadian Tire Centre on Saturday. 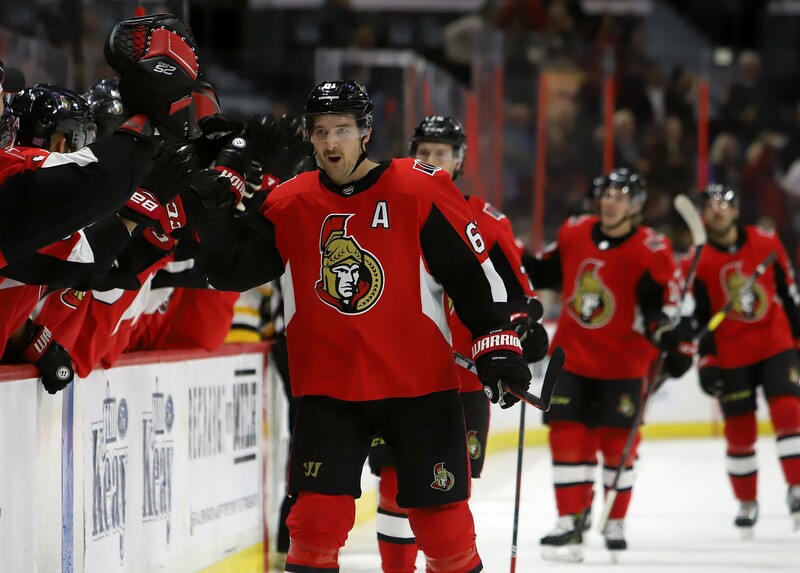 Mark Stone scored twice, Mikkel Boedker, Ryan Dzingel and Drake Batherson each had two assists, and Craig Anderson made 31 saves for Ottawa (9-8-3), which has won two straight and three of four. Kris Letang, Zach Aston-Reese, Matt Cullen and Patric Hornqvist scored, and Phil Kessel and Evgeni Malkin each had two assists for Pittsburgh (7-8-3), which is 1-7-1 in its past nine games. Matt Murray allowed three goals on 10 shots. He was replaced at the start of the second period by Casey DeSmith, who made 12 saves. Letang gave the Penguins a 1-0 lead on the power play with a slap shot from the point that went off the right post and in at 11:59 of the first period. Brady Tkachuk shot into an open net on a rebound to tie it 1-1 at 14:33, and Stone gave the Senators a 2-1 lead at 17:07 when he redirected a point shot from Thomas Chabot. Duchene made it 3-1 at 18:50, redirecting a pass from Boedker through the legs of Murray. Stone extended the lead to 4-1 at 16:35 of the second period with a shorthanded goal. After intercepting a pass from Penguins defenseman Olli Maatta in the neutral zone, he beat DeSmith with a backhand on a breakaway. Cody Ceci scored to make it 5-1 at 17:21. Duchene had an assist on the play for his 500th NHL point. Aston-Reese made it 5-2 at 2:20 of the third period when his shot deflected off Senators defenseman Dylan DeMelo’s stick and past Anderson. Cullen cut it to 5-3 at 5:34 on a rebound in front. Duchene scored five-hole on a breakaway to make it 6-3 at 9:05. Hornqvist deflected Kessel’s initial shot in front to cut it to 6-4 at 16:56. Kessel has seven points (two goals, five assists) during a four-game point streak. … Duchene has nine points (two goals, seven assists) in his past five games.